1st Gen Strom Over the Dash GPS mount - AdventureTech, LLC. The GPS mount comes with a 1" Ram B ball and stainless steel hardare. 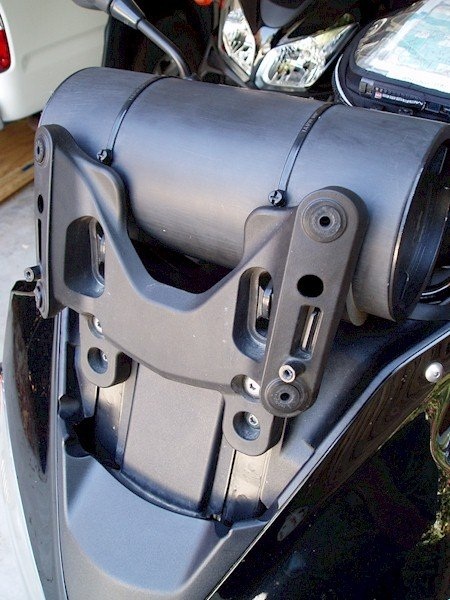 The mount easily and securely bolts to the bike requiring no modification. It is fully compatible with the Madstad bracket. The ram ball, bolt, and GPS plate use 5/16 x 24 threads. The plate is threaded so that it acts like a lock nut in conjuction withthe female ram ball. There are three major assemblies involved. 1. The windshield and hardware that attached to the windshield to the windshield carrier. Remove the windshield by removing the Phillips head screws holding the black plastic covers, them remove the four screws holding the windshield in place. Lift the windshield off of the windshield carrier. The height of the windshield carrier can be adjusted (e.g., be moved up or down) by selecting different sets of holes in the cowl. The GPS mount uses these holes in the cowl. Remove the four bolts attaching the windshield carrier to the cowling. Place the four spacers provided with the GPS mount in the openings where the windshield carrier bolts had been. Place the GPS mount plate on top of the spacers and insert the supplied bolts. UNLESS - you are using an unsanctioned windshield position. If so, and if you want to continue using this kind of position (I do not recommend it), then you will need to use two 6 mm lock nuts and washers secure the bolts from the back of the windshield carrier.